Muzharul Islam dedicated his whole life not only to demonstrate through his own work the issues that architects of the region should be concerned with, but also to talking writing demonstrating on environmental and urban issues, political issues and social issues. His profound love for his country and respect for it and its people motivated him to continuously better the environment that his fellow citizens lived in, and to consciously try to change social and political viewpoint to achieve a greater social order. Muzharul Islam was given the work to design the national parliament building of which he had even started work. But then he decided that if the work is given to a master architect it would work as a continuous source of reference for the future generation of architects. He then instrumented Kahn’s coming to Dhaka to design the parliament building Thus his sacrifice of his own work to Louis I Kahn remain his greatest gift to the architects of this region. He became the President of the Institute of Architects of Pakistan in 1968-1969 and he was the creator and the first President of the Institute of Architects Bangladesh. He was a member of the Academic Council on the first School of Architecture of Bangladesh and his contribution to the education of Architecture in the country is yet to be equalled. Besides being the most gifted architect of the country Islam has always been a strong social activist and has tried not only to shape the city but also address how physical planning can be used to provide a better environment for all walks of life. He has constantly fought against policies that would have lead to social discrimination and would have been detrimental to our physical environment. It is because of his foresight and efforts that the Physical Planning ministry was created in Pakistan. He was awarded the IAB gold medal for his unparallel contribution to the architecture in the region in 1993. He was awarded with one of the most prestigious award of the nation the ‘Independence Day Award’ in 1999 for being an outstanding son of the nation. His work and thoughts also brought him international recognitions. He was invited to be the juror of the Faisal Mosque competition in Islamabad. 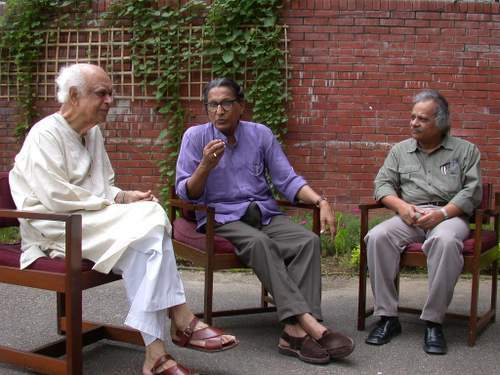 He was also a member of the Master Jury of the First Aga Khan Award for Architecture, Geneva in 1980. 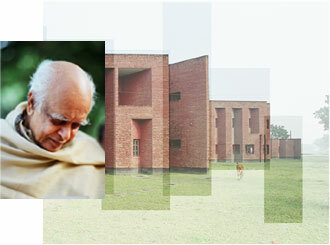 He was awarded with the honorary fellowship of the AIA in 1999. Also in 1999.he was awarded the J. K. Cement Grand Master Award. He has been inspiration to all the following generation of architects, and has set the course, of the concerns to be addressed, in architecture, planning and environmental planning in a country such as Bangladesh. His work and life is not only a legacy for Bangladesh but a well of knowledge of direction to the Architects of the region. His contribution to architecture, the education of architecture, and the directions in how architects can and should contribute to change society and environment, makes him the most revered Architectural “Guru” of the region. Muzharul Islam (1923-2012) is widely acclaimed as the most influential architect of Bangladesh. His pioneering work from the 1950s onwards not only signalled the advent of Modernism in Bangladesh (then East Pakistan), but almost overnight introduced a fresh culture of architecture in the contemporary scene hitherto populated by lesser examples of international style. Teacher, Architect Activist, and Politician, Islam set to course architectural practice in the country not only through his own many varied works, but contributing to the architectural education in the country and also through being instrumental in inviting the likes of Louis I Kahn, Stanley Tigerman and Paul Rudolph to work in Bangladesh. 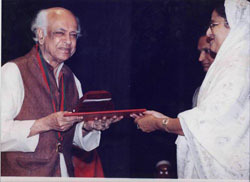 The summation of his oeuvre is impossible without an understanding of Muzharul Islam’s deep seated concern and commitment to societal change and the strength of ethics of practice, which results in his work and thinking being considered as a vehicle for transformation rather than as an end in itself. The present this web site offers a comprehensive documentation of the man and his work. Selected projects and works help trace a career spanning more than fifty years and give appraisal to a masterly production which has come to transgress history, boundaries and styles. In 1942 Islam received his Bachelor of Science from Calcutta University, in 1946 Bachelor of Engineering from Calcutta, in 1952 Bachelor of Architecture from University of Oregon, USA, in 1957 a post Graduate Certificate in Tropical Architecture from The A.A. School of Architecture in London, and in 1961 he received his Master Degree in Architecture from Yale University, USA. On returning to his country he took it upon himself not only to establish a modernist language of architecture in this region that was sensitive to our social, cultural, climatic and economic context, but also to organise the practise and education of architecture in the country. Muzharul Islam was a true modernist and fought to establish a Bengali modernity free from any kind of strains of superficial regionalism. In his own words “You have to be a world man and a Bengali. It’s impossible otherwise…. When I mention standing on one’s own soil… it is to find oneself, but not to find oneself and become stagnant. What I am seeking is to stand on one’s own feet and then to proceed forward. If for that reason I have to take two steps backward to go one step forward. I have no problem with that. I think that there is no other way of moving forward (1992)”.